RP1991 is rated 4.5 out of 5 by 2. Rated 5 out of 5 by jet726 from just as promised The parts came quickly and were just as promised. Installed quickly and did the trick. Does this protect from shower going scalding hot if a toilet in second bath gets flushed? Thank you for your question. Delta Faucet model # RP1991 was used in the 1600 series model faucets. It was used in the pressure balanced and non-pressure balanced faucets. The cartridge itself is not pressure balanced. Where can I find a new set of springs for the rubber seats? The new cartridge comes with new rubber seats, but no springs. What bonnet and sleeve can be paired with this stem? I believe I will reuse the escutcheon I have (although it is not preferred). I am also wondering what handle - prefer a knob rather than a lever-type handle. Is there a trim kit on the market compatible with this unit? Jamie, thank you for your question. We have available the cartridge (Delta part #RP1991), however, the square escutcheon plate is not available. Our round escutcheon plate (Delta part #RP6083) is available to use, but the hole size in the wall would need to be smaller than the square. 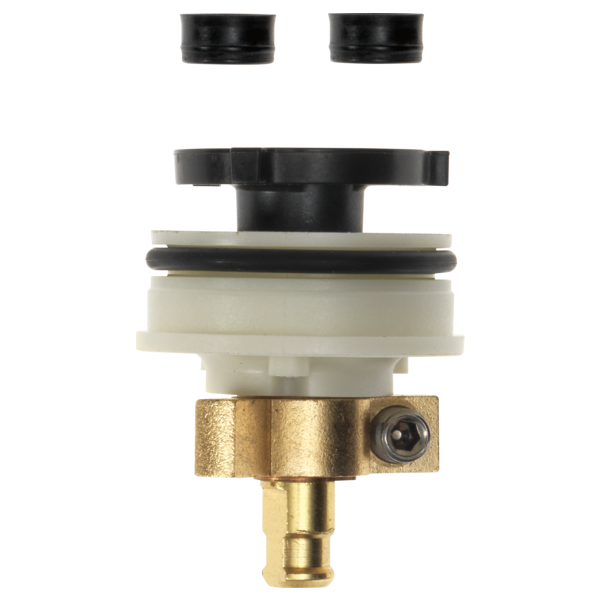 We recommend replacing both the rough-in valve as well as the trim. Please see picture. I have this cartridge RP1991 installed. The crystal knob is very close to the wall, and the hole on the wall is very small. Will plate #RP6083 fit? If it does, do you have a bronze one? if RP6083 won't fit, what do you recommend? Thank you very much! I just discovered that the hot and cold operation is reversed on my RP1991. Can this be corrected by reversing the cartridge or do I need a plumber to switch the pipes in the wall? is the RP1991 a replacement for the Peerless RP70538? Thank you for your question. Delta Faucet model # RP1991 is used on the 1600 series tub/shower faucets and is not a replacement for the Peerless Faucet model RP70538.